No one knows how but two goats managed to get themselves stuck on a narrow beam on a 50-foot-high bridge in Pennsylvania, USA. The two animals escaped a nearby farm in the state and somehow walked on an eight-inch-wide beam of the bridge, trying to take shelter from the rain, reports Tribune Live. The animals were found stranded on the Mahoning River Bridge by local police who sought help from the transport department and highway toll authorities to rescue the goats. A massive crane lent by the transport department eventually saved the two out of the precarious spot. 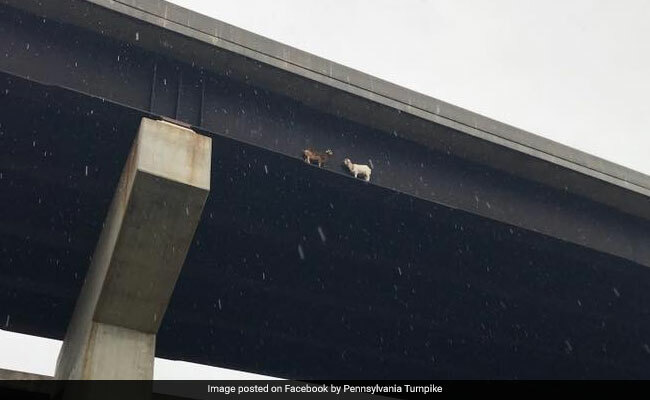 A series of images posted by the Pennsylvania Turnpike, the toll authority, showed the goats perched on the narrow beam while it rained. In one photo, a crane was lowered along with two state employees who eventually rescued the runaway goats. The Facebook post, which has been shared over 50,000 times amused the Internet. While some thought the goats would've probably figured their own way out of the sticky situation, many others appreciated the efforts made to rescue them. "I seriously doubt they needed rescuing," commented one person on the photos. "They were probably just fine. They are goats! Best balance and climbing abilities! Left alone they would have finished their stroll across the bridge and found something else to climb," added another. "Thank you to all the heroes!" wrote a third. And of course, there were plenty of "punny" comments as well. "Who ya gonna call? GoatsBusters!" joked one person. "Poor kids (haha, no pun intended)," wrote another. The goats were returned to the farm they had escaped from.